Covered Bridges first appeared in the U.S. around 1805, but the history of these monuments to another age date back thousands of years to China. Covered bridges had also existed in Europe since medieval times and there were once hundreds of them in Switzerland, Austria and Germany. But it’s here in the Northeastern U.S., where wooden covered bridge design and construction reached its pinnacle in the nineteenth century. A combination of pressing need, plentiful old growth northern forests, and sheer Yankee ingenuity, advanced the development of wooden covered bridges to a rare combination of marvelous engineering feats that were also pleasing to the eye. WHY SO MANY COVERED BRIDGES IN THE NORTHEAST? The northeast is a region of rivers, streams and creeks. As the population surged out away from coastal areas into the forested interior, villages sprung up near water sources. The water source was used to power mills in these towns, and villages often developed on both banks of a stream or river. Bridges were the obvious answer to connect these divided communities, and provide access for townsfolk to things like school, worship, and supplies. While much speculation has been put forth on this topic; the simple answer is protection against the weather for the bridge. Here in New England, where I live, covered wooden bridges last about three times as long as those exposed to the elements, and reduce bridge maintenance as well. During the 19th and early 20th century very few bridges built were not covered. Most historians agree the first covered bridge in America was The Permanent Bridge completed in 1805 in Pennsylvania, originally designed by Timothy Palmer from New England. The longest known covered bridge is The Hartland in New Brunswick, Canada, which at 1,282 feet spans the Saint John River. But perhaps the most famous covered bridges are in Madison County, Iowa. The Bridges of Madison County used to number 19, but today only six survive. 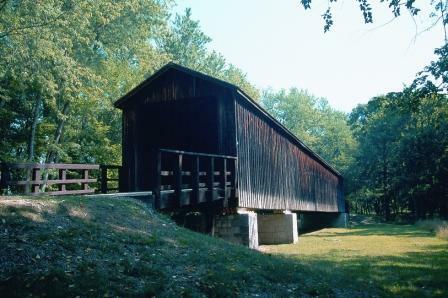 Robert James Waller’s novel, and the movie of the same name, popularized these bridges to millions worldwide, and also provided evidence that covered bridges in North America are by no means limited to the Northeast region. A question often asked is why so many of the bridges are painted red on the outside? Historians believe the red coating makes the bridge seem more like a barn to a horse, and as horses tended to be skittish about crossing above flowing water, the illusion helped farmers and travelers navigate the obstacle with little incident from their four-legged friends. As the twentieth century progressed bridge construction changed and metal manufactured truss bridges became first choice over wood. The ease of construction, increased strength, and low cost of these metal bridges became too overwhelming to ignore for budget conscious communities in the U.S. The "work horse" bridges of the 19th century gave way to economics, and most wooden covered bridges in the U.S. quickly disappeared, except for the 800 left for admirers to view today. Though many of the remaining covered bridges still carry traffic - even cars - most are kept and maintained for tourism, and as a reminder of our heritage. For sheer volume Pennsylvania and Vermont take honors, accounting for well over a third of the remaining bridges. Self-guided tours are also popular in New England for covered bridge vacations, particularly in Vermont and New Hampshire where many of the bridges are close to other destination and attraction spots. As a covered bridge enthusiast I can tell you half the fun is finding the bridges. The major highways bypassed the roads where most bridges are located many years ago, making the remoteness of a covered bridge sometimes an adventure in locating. While covered bridges make ideal photo opportunities there’s much more to view than just a pretty picture. Experts suggest appreciating the bridge by first taking in the design and massive timbers used in the framework. For authentic bridges these timbers came from virgin forests where 100 feet high trees were common. As you view an authentic covered bridge remember it was built for a simple functional purpose - getting from one bank to other. But it was constructed with the skill and care of craftsmen, who’ve unwittingly left a rich heritage for future generations to enjoy. Treasure these woodworking masterpieces as you travel rural North America, and rediscover a symbol of the pioneering spirit that embraced both U.S. and Canada during the nineteenth century.